Famen Temple （法门寺） is the closest thing in China to Egypt’s discovery of King Tut's tomb. While not nearly as ancient as King Tut, the Tang dynasty treasures sealed in a vault under the pagoda at Famen also escaped the rapacious attention of tomb robbers and lain forgotten for over a thousand years. When the archeologists found the contents to tally perfectly with an inventory list, in a stone tablet found alongside, they concluded that the underground vault had not been disturbed. The temple had a decidedly ragged history. It was the favorite place for early Tang emperors to go and pray to Buddha for bountiful harvest and a reign at peace. It then fell in disfavor during periodic anti-Buddhism movements. By Ming and Qing dynasty, being remotely located far away from any urban center, it was largely a forgotten place. At some point, lightening struck the pagoda and knocked off half of the tower. It was not wholly forgotten, however. An old man in the nearby village, fearful of the invading Japanese troops that might break into the underground vault under the pagoda, had set himself on fire at the entrance. The resulting bad karma discouraged anyone that might have been curious. 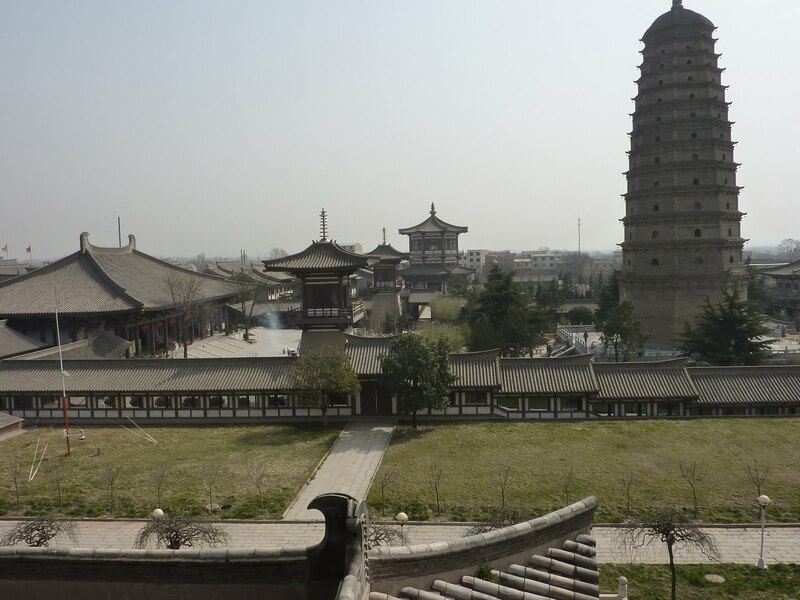 In the 1980’s the rest of the pagoda toppled and the local authorities decided to investigate and make a determination as to whether the complex was worthy of the cost of restoration. They were thunderstruck by what they found in the sealed underground vault. They found ornaments, scepter, and vessels of silver and gold of exquisite craftsmanship, the best available during the height of Tang dynasty. These were personal tributes from Wu Zetian （武则天）, the only woman emperor and arguably one of the most powerful in China’s history. The first time I visited Famensi it was around 1995 not long after Famensi reopened as a tourist attraction. It was a long drive and took nearly a half day to get there. I remember the priceless items on display and wanted to see them again. This time, it only took one and a half hours on expressway from center of Xian in the direction of Baoji. 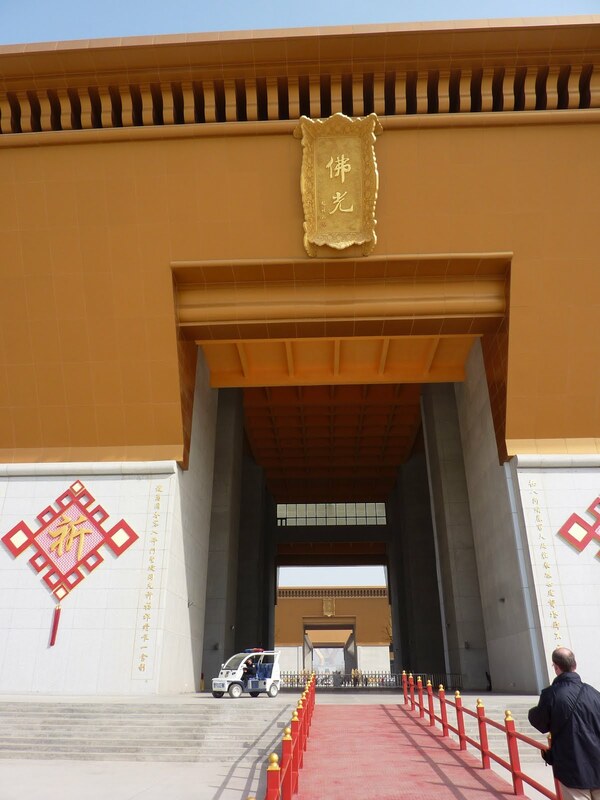 On approaching Famen Temple, we noticed a massive, newly built complex of gray granite and faux gold facade. 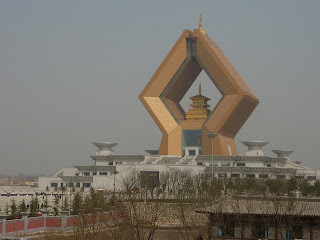 From the distance, we could see a giant golden, diamond-shaped edifice at the far end of the complex. As we approached, we could see that the diamond was formed by two somewhat abstract cupping hands joined at the wrists and fingertips. Nestled in the hands was a golden temple—a giant replica of one of objects found in the base of the original pagoda. 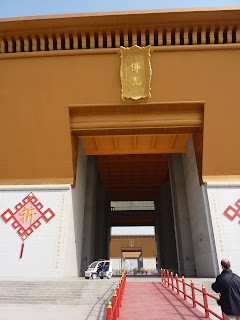 It turned out that this new complex was the new entrance to the Famen Temple. Visitors to the temple now walk through the new building. The enormous front façade contained three main entrances whose purpose seemed to be to make the visitor feel tiny. As we walked through the lobby, we could see as yet not completed areas for future shops. We then came upon a courtyard with two huge reflecting pools complete with plastic water lily pads with sun bleached but never wilting flowers. A row of stone lions stood on the side of one pool facing a row of stone elephants on the far edge of the opposite pool. 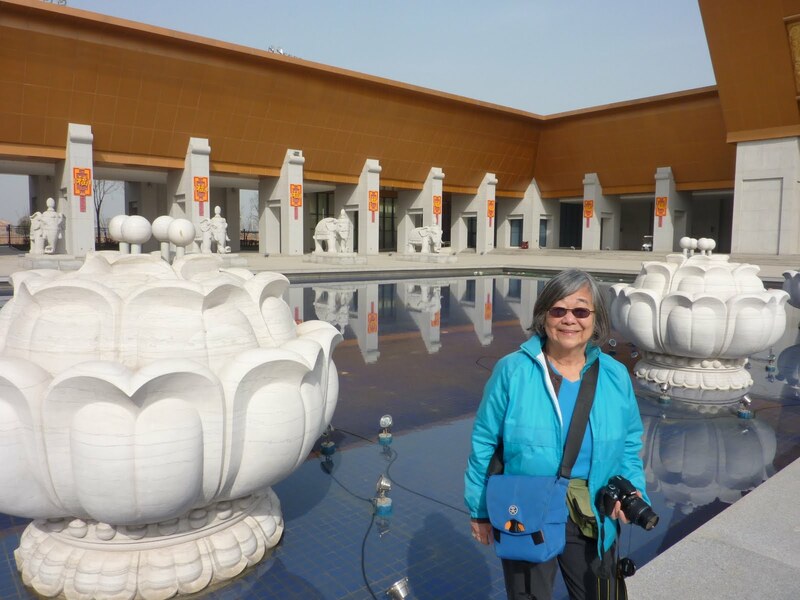 Walking in the middle walkway between the two pools—that felt more like a causeway, we entered an airy hallway, open to the sky. On the left of the hallway, we passed a restaurant zone. On the right facing the restaurants was a hotel for overnight guests. Opened since the 2009 Olympics, we could not tell if all the facilities were ready for business. At the end of the courtyard, we came upon a long promenade leading to the new temple crowned by the aforementioned diamond. 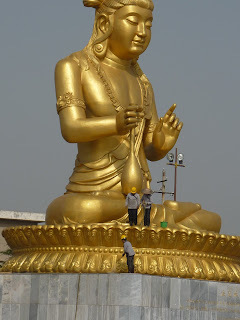 On the two sides of the promenade were huge golden statues of various major Buddha figures. 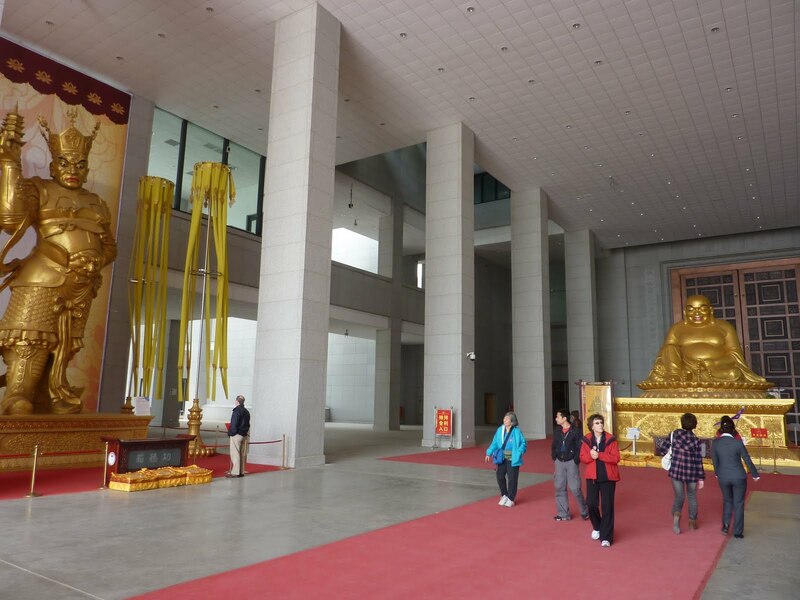 In between the statues were golden pillars with Buddhist scripture in prominent black. For those not wishing to walk the length of the promenade, rides on electric cart were available for an extra fee. At the end of the promenade, after a flight of stairs, the visitor would enter a new temple to be greeted by four heavenly guardians and the smiling Happy Buddha, all in gold color, and then enter the main hall, in a layout that followed the traditional layout of Buddhist temples but bigger and grander. On display in front of golden stature of Sakyamuni was the holiest relic in Buddhist religion, namely the original finger bone of Prince Gautama, found among the treasures under the pagoda. The rest of the treasures were on display at the original grounds of the Famen Temple, to the right of the new complex. 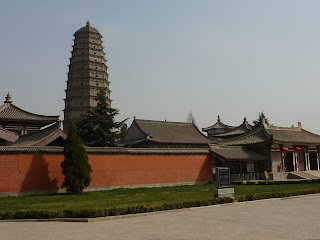 The museum built to house the objects was in neo-Tang dynasty style, far less flamboyant and blended well with the newly restored pagoda and temple. The main museum building in three floors were inspired by the same golden temple resting inside the diamond on top of the new edifice. The unique items of the Famensi were now properly displayed in a building of its own. I am certain that there will be many visitors whose object is to see the original imperial gifts from Emperor Wu and could do without the ornate granite and gold and the implied ostentation. On the other hand, it will take a long time to forget Famen Temple again.